* Selected in the third round (17th overall pick) by the Chicago Red Stars in 2013 NWSL Draft. 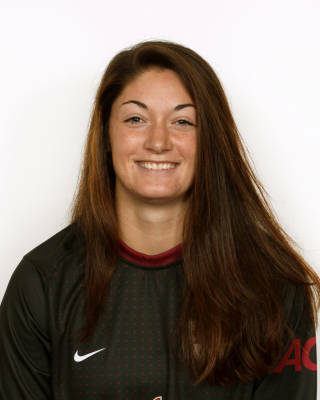 * Played in seven games in her final season at FSU tallying over 240 minutes on the pitch. * Recorded a win and a shutout in her only start – playing all 90 minutes against Jackson State. * Did not allow a goal in her seven appearances making four total saves. * Helped preserve a shutout in her six other appearances as Florida State went on to set the school record for shutouts in a season with 17. * Saw action against Mississippi Valley State and Texas A&M in the NCAA Tournament. * Appeared in seven games making three starts for the Seminoles in goal. * Posted a record of 2-1-0 with a pair of shutouts. * Registered shutout victories over UAB and NC State. * Made 15 saves in over 406 minutes of action on the pitch en route to posting a .714 save percentage…recorded a season-high six saves at Virginia. * Allowed goals in just two of her seven appearances. * Made her Florida State debut at the start of the second half against North Florida…played 40 minutes and did not give up a goal. * First career start as a Seminole came at UAB…played all 90 minutes and made two saves for the shutout. * Saw action in goal against Stanford in the national semifinals at the KSU Stadium in Kennesaw, Ga.
* Started 35 games in her first two years at Louisville recording over 3200 minutes in goal and posting a record of 15-20-1. * Made 183 saves in two seasons including 125 stops in 2010…posted a career .766 save percentage with eight shutouts. * Member of the U.S. U-20 and U-17 National Teams…recipient of the Golden Glove award at the U-17 Women’s World Cup – led U.S. to the finals. * Played with the Illinois State team (2006-08), Region II team (2007-08), Eclipse Select (2005-08) and Real Colorado Cougars in 2009. * 2007 ODP Region 2 Camp Golden Glove, 2006 US Youth Soccer National Championships Golden Glove. * Daughter of Rick and Becky Vancil. * Has a brother Derek and a sister Paige. * Majoring in social sciences.